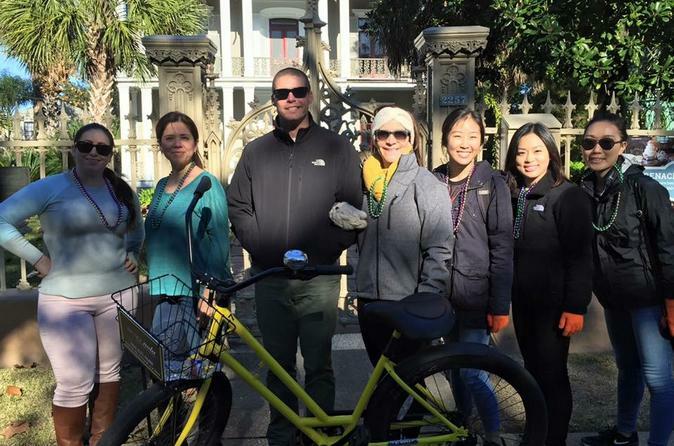 A rich 3 hour bicycle tour, starting on the Creole side of town in the French Quarter, provides you with the sights, sounds and early history of New Orleans. From there venture on to the American side of the city, known as the Garden District with it's beautiful 19th century opulent mansions and remarkable stories. This tour is for a maximum of 12 people. On this tour visit: Banks of the Mississippi, French Quarter, Lafayette Cemetery #1, The Lower Garden District, The Mansions of the Garden District. Begin with a ride to the banks of the Mississippi River learning how it shaped the landscape and where the first Europeans landed and founded the city. Then weave your way through the original 1718 New Orleans; visit the oldest and most historical landmarks, tell the tale of the city's early beginnings. Next, travel to Faubourg Marigny, view original Creole homes while learning of the famed division between the Americans and Creoles of this time period. This tour will show you an almost hidden street where some of the best live Jazz music can be found. With a rich understanding of the city's early history, venture onward to explore the “American” side of New Orleans where you'll learn about Southern American life pre and post Civil War. As the tour rolls through the Garden District, discover the remarkable stories behind the Americans of the 19th century who built large, opulent mansions that have captivated visitors for nearly two centuries. The Garden District has been featured in countless movie and film projects and has attracted many celebrities to live in the area. Stroll through the oldest city-owned above ground cemetery to learn about the unique way New Orleans inters loved ones. The tour ends passing through the Irish Channel, learning how New Orleans immigration and foreign contributions made this lavish lifestyle possible. Why choose a tour that can only show one side of town? See it all on this Garden/French Quarter Combo tour!